Wanda Bond Wright’s new book “Seasons of the Street, Revealed” details the dark events in life of an African American that lead to her eventual quest for redemption. 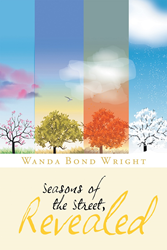 Recent release “Seasons of the Street, Revealed” from Page Publishing author Wanda Bond Wright is a harrowing autobiography that describes in blunt fashion the author’s troubled past. Wanda Bond Wright, a loving grandmother and devoted Christian, has completed her new book “Seasons of the Street, Revealed”: a devastating account of the author’s life before she found the wisdom of the importance of faith and family that she knows today. Published by New York City-based Page Publishing, Wanda Bond Wright’s tale introduces her as a young African American woman who believes that her good looks and pursuit of a good time will get her through life. What she finds instead is a constant struggle to just make it through each day. In a few short years, Wanda is subjected to the throws of poverty, teenage pregnancy, drug addiction, and imprisonment. Through all of her experiences, she learns that she needs to make some major life changes if she wants to be proud of who she is. While the streets of a traumatic life are riddled with people who only wish to use naïve girls who believe themselves invincible, Wanda finds that there is one individual who can be found in even the darkest of places who wants nothing more than to repair even someone as broken as she is. Readers who wish to experience this potent work can purchase“Seasons of the Street, Revealed” at bookstores everywhere, or online at the Apple iTunes store, Amazon, Google Play or Barnes and Noble.